It’s also striking how any criticism or even opposition to our involvement in Syria, the media coverage, our policy of confrontation, has been totally banished from the state/corporate controlled media. It’s like we’re at war already with Russia, which, I think we are in reality, only our armies aren’t clashing directly, not yet. Supposedly we’re living in a liberal democracy, yet no opposition is allowed anymore, and, as an example of where we are now, the Guardian has lurched from ‘liberalism’ towards totalitarianism, which should make people concerned as it’s a clear indication and sign of where we are heading. That is surely the salient feature of end-stage neo-liberal capitalism-its utterly totalitarian nature. NO diversity of opinion in politics. NO diversity of opinion in the fakestream media sewer. A drive for totalitarian censorship of ANY venue still producing Badthink, ie saying ANYTHING favourable concerning Russia, China, Iran, unionists, etc, and a tiny rage of acceptable opinion in other matters, such as the ecological Holocaust, although there the majority of the Rightist fakestream media is insanely mendacious and vicious in its hatred of ‘Greens’. Plainly such economies, there being no such thing as societies, insanely aggressive, socially vicious at home, driven by insatiable greed and a real loathing of the capitalist elites’ Eternal Enemy , without and within, other people, MUST destroy itself, either in some sort of genocidal global war, or savage civil wars between the brain-dead and brainwashed and the sane remnants, or through ecological collapse. The last is almost certainly far beyond any point of return, as more and more ecological researchers are admitting, joining the Near Term Human Extinction camp, a sad inevitability as the Right are becoming ever more fanatical in demanding that the destruction of Life on Earth MUST go on, and they kill hundreds of environmentalists who get in the way of their insatiable greed, every year, in the poor world only, so far. As you might have seen, an Austfailian hard Right fatball politician recently posted a picture of himself with a handgun held in shooting position, declaring, ‘Well Greenie punk, are you feeling lucky?’ a la Dirty Harry. When there was some outrage, he moaned about Greens ‘not having a sense of humour’. And his acolytes inundated Green politicians with death-threats, some savagely misogynistic as well. We have been in total fascistic totalitarian governance since Thatcher and Reagan. How many so called liberals are asking for peace and not war these days? It’s also grotesque that the liberal media hasn’t got a good word to say about Trump, which surely no one denies, apart from when Washington is at war or threatening to launch even more wars. Suddenly, US foreign policy is off-limits for criticism, it doesn’t have any kind of ‘hidden agenda’, it’s all taken at face value and is seen as both ‘lawful’ and necessary; in contrast to virtually everything else they do. Compare and contrast the situations and coverage on US attacks on Mosul in Iraq and their support of the Saudis in Yemen, with how Aleppo or Ghouta are presented… the differences are striking and outrageously biased and partisan. The crass sentimentality of the Guardian’s reports with tiny tots covered in dust and ketchup, the heart-rending stories and testimony from the actors, all presented as if the rebels are paragons of truth and virtue, is an insult to one’s intelligence. What about interviews with supporters of the Syrian government inside Ghouta? Why don’t we hear from them? Are we supposed to believe, if this is really a ‘civil war’ that there aren’t any? Why no interviews with people from Damascus who are subjected to rocket attacks coming from Ghouta? Isn’t it odd that we don’t ever see pictures of the fighters in Ghouta? What happened to them? Are there only innocent civilians there? How come the guys with cameras are always there when the bombs drop, almost like they know where they are going to land? What kind of liberal democracy are we living in when blatant war propaganda controlled at source by the rebels/terrorists, is presented as real and not fake news? I refuse to believe that war propaganda has ever been more biased, dishonest, hypocritical and just plain filthy than that regurgitated with 100% Groupthink by sewers like the Fraudian. I knew it was going to be bad at the beginning of the jihadist assault when our local ‘multi-cultural’ TV station, SBS, broadcast video of a massive, millions strong, pro-Government rally in Damascus, as an ‘anti-regime’ protest!!! And their coverage has gone downhill from there. More sanctimonious war propaganda in the obscene Observer. Clearly the “Last Hospital in Aleppo”, has surpassed the “Fast and Furious” franchise by over 200%. Quite a feat really! Another Docu-Gong in the making? Here we go again with the hospital bombings and all the pictures of the white helmets saving children drenched in blood . I also read an article today , not sure of the veracity , but stated that East Ghouta was full of US and allied advisers,presumably to the terrorist flavor of the day .This is why the MSM is squealing constantly about humanitarian atrocities . Also to note that the Syrian government has repeatedly asked for the civilians to be allowed to leave , with no response of course .The civilians are being used as human shields for these bastards. The MSM cry for civilians to leave, yet refuse to report that all day Jaysh al-Islam have been raining rockets and mortars on the humanitarian crossing points. Not something Nikki Hayley would want to include in her speech: it would detract from her Russophobic mania. Also, highly suspiciously: brand new terror outfit Jabhat Tahrir Souriya are in the process of wiping out HTS in NW Syria …a bit early for an American spring clean? @summitflyer: “children drenched in blood .” Drenched in ketchup, thank goodness. Other children in these terrorist hands were not so lucky — poisoned to make a Sarin false flag. Vanessa Beeley uncovers the facts about Whitewash Helmets terrorist activities and their support by British terrorists in Whitehall. Meanwhile, back in the real world, Russia celebrates re-unification with Crimea. The article in Saker Vineyard is titled Sebastopol which, for Tennyson fans, adequately describes the role of NATZO in the Ukraina as in Syria: “Someone had blundered”. Thank you for your reply. I really enjoyed reading it. I am so pleased that Crimea has been reunited with Russia, and I hope that all other Russian historical territories in Ukraine will also be reunited. Yes, NATO bombed Serbia, but it payed a heavy price (I am Serbian by the way). When the bombing offensive began, NATO assumed the Serbs would immediately surrender. They did not. We shot down 137 NATO aircraft and 25 helicopters, mostly with Russian equipment. Among the aircraft we shot down was one F-117 (seen on TV) and one B-2 (not seen on TV). The Americans still refuse to admit they lost it over Serbia, claiming it crashed in the US. The name of that B-2 is “Spirit of Missouri”. I have never been to Russia. When I do come, I will certainly visit the Crimea. Greetings. We shot down 137 NATO aircraft and 25 helicopters, mostly with Russian equipment. In Vietnam, they have a park displaying the remains of some of the thousands of American aircraft they shot down, and Russian equipment they used. It’s called the “B-52 Victory Museum“. Among the aircraft we shot down was one F-117 (seen on TV) and one B-2 (not seen on TV). Serbia should have a similar park. They could call it the “B-2 Spirit of Missouri Victory Park”, after the star attraction. That would get up its former owner’s nose. I attended the local anti-NATZO demonstrations, at the time. As far as I could tell, I was the only non-Serb who did. So much for the “left”, same as now. Sorry to sound uninformed but are the Russians bombing different hospitals around Aleppo, or do they bomb the same one, then bomb it again, and again as soon as it is hastily reassembled by the non-partisan White helmets? I usually get my info about Syria from the Guardian’s digital culture expert in San Fransico but Olivia Solon seems to have dried up on reports about damage to medical infra-structure. 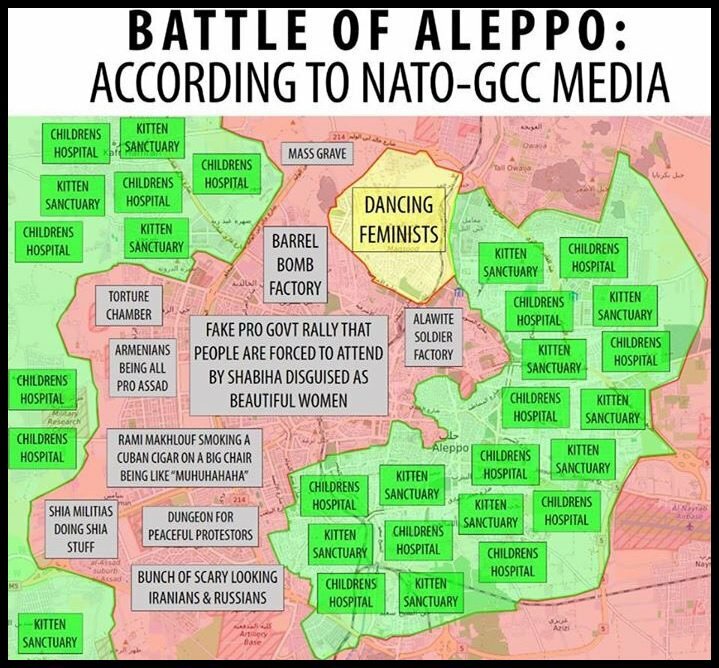 If only the Russians would pick on an orphange or old peoples home rather than continually bombing the same hospital, or is it twenty hospitals left in Aleppo. They bomb donkey sanctuaries when they arent bombing hospitals. Surely the only suitable news source for you should be based in Tel Aviv, Doha or Riyadh?! They bomb pop-up hospitals in some sort of weird Whack-a-Mole game in East Ghouta.